Well, getting started here again with another splendid series of wooden pallet furniture projects. This has certainly been a long range of pallet wooden projects compiled in a series. Where we have tried our level best to bring you guys each and every furniture item that is needed in the house hold. These wooden furniture items include articles for every portion of the house. 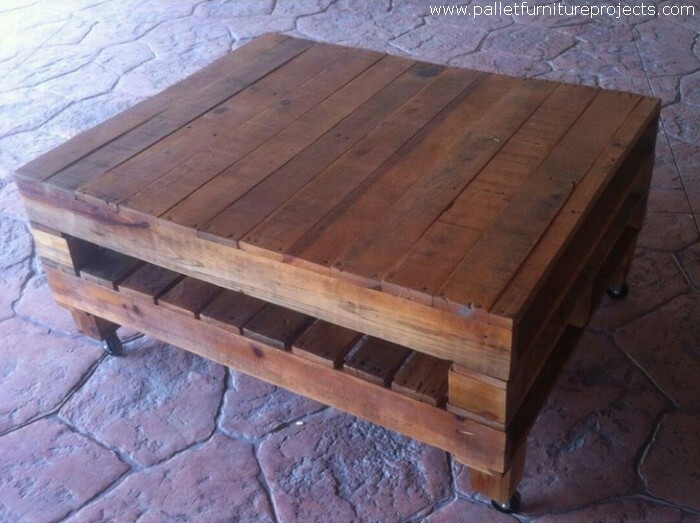 Here again we have selected some decent pallet wood repurposed furniture items. They are all going to be recycled with mixed sort of shipping pallets which would include broken and fresh shipping pallets as well. This L shaped grand pallet wood couch is made in such a way that it seems absolutely similar to the matching wood pallet coffee table. Another feature that is common here is the wheels on the base to make the whole set up mobile. So now this would be easy to drag them on your desired place. 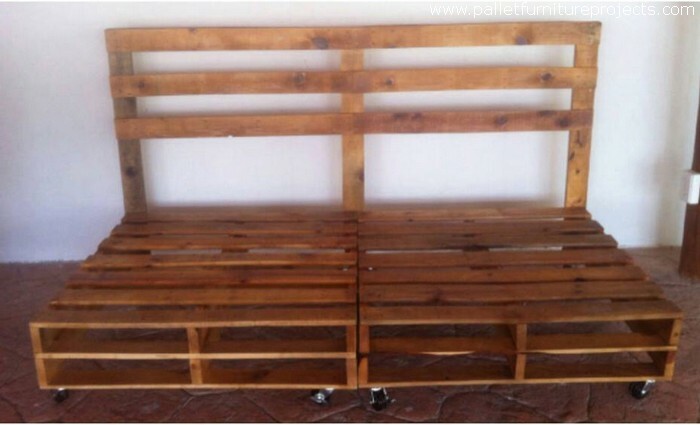 Do you see this two or three seater pallet wooden couch? 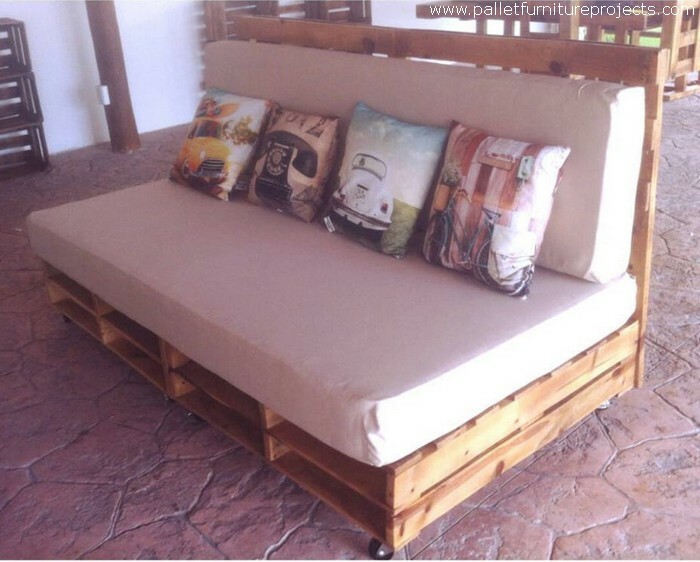 I think the simplest pattern of the pallet wood couch is used in here. Seems like two whole pallets are put simply one on another and a smart back is installed behind. 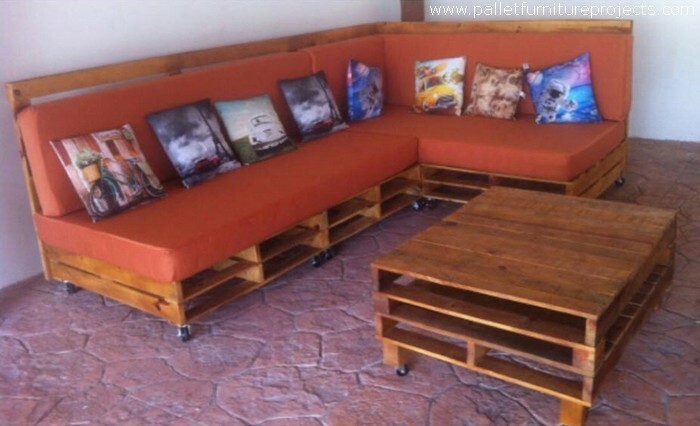 Now have a closer look on this pallet wood repurposed couch. 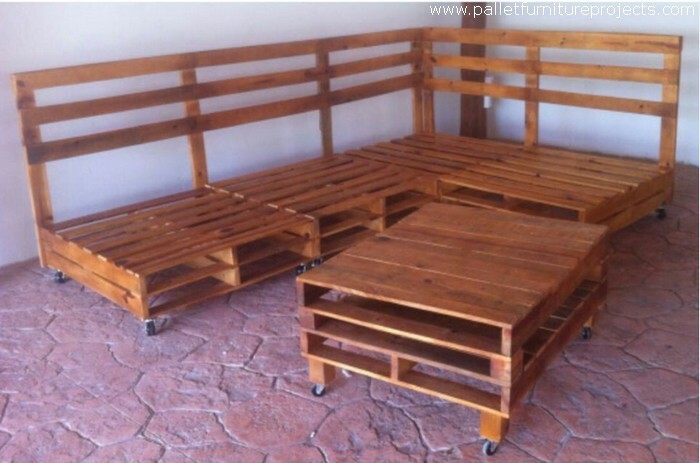 The same shipping pallets are just joined together to make them look like a couch. If only the back is removed from this, it would look like a moving coffee table. Like the idea? Then just try it. 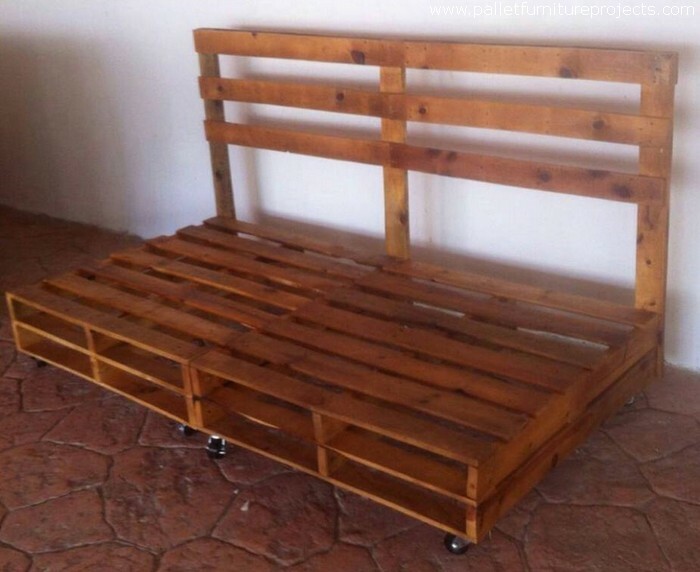 This whole sitting plan was designed by our fellow wood pallet crafters. They were of the view that one article here should be plain and rustic, and the other one should be a contrasting one with a totally different shade on it. So this way this set up was created. Now come closer to the L shaped grand pallet wooden couch. We can clearly see that although the shipping pallets are pretty old but still they are less broken and deteriorated. 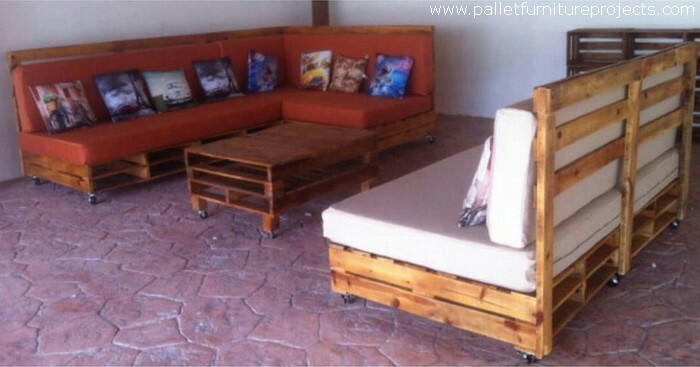 These shipping pallets were obtained from a construction site pretty free of cost, and look they just worked for us. If we talk about it as a carpenter, two whole shipping pallets are combined together and joined with nails and glue. While the back is kept simplest, just like a couple of straight planks are fixed on the back. So the back was made just for the support not for the beauty or shape. 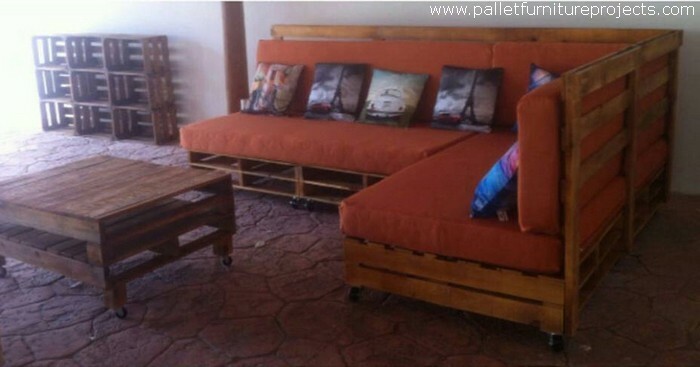 This whole wood pallet recycled furniture range is made especially for the lounge because this is so grand in design and size, so this would be a bit harder to place it inside the tiny rooms. So try to place it on some spacious place so that much space is not captured. 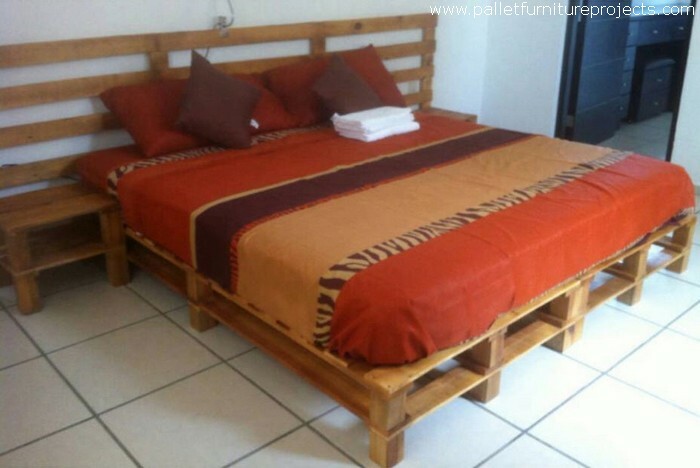 And lastly this wooden pallet upcycled room bed is an additional surprise. This is going to save some more of your bucks that were anticipated to be spent for the new room bed. And the good thing about this one is that again the design is very easy and handy.